In the heart of downtown Jamestown on a June night in 2002, despite the dim light of the late hours, the construction workers hired to take down the deteriorating brick façade of the ancient hotel on Pine Street thought they were seeing faces, until they came to the word “Buffalo.”1 They stopped all work. They didn’t know what they had just uncovered, but their collective instinct told them it was something historic. It turns out they were right. I remember learning about Buffalo Bill in third grade deep in the bowels of Woodlawn Elementary School. I remember him because I remember anything that references “Buffalo.” That his nickname referred to the animal and not the city didn’t bother me. As a child the fantastic life of William Cody captivated my attention, just like the Wild West shows at Fantasy Island. Little did I know, although the famed Pony Express rider and expert marksman did shoot all those buffalo, much like the make-believe shows at Fantasy Island, Buffalo Bill became a star only after dime-novel author Ned Buntline wrote a series of adventure stories about Cody to help promote his early tours, perhaps even the one performed in May 1878 at the Allen Opera House in Jamestown, New York. Don’t fret, fans of the era of Buffalo Bill, the west hasn’t left Greater Western New York. Just a few miles up the road from Jamestown (Route 60, to be specific), you’ll find, still in Chautauqua County, the town of Gerry (pronounced like the name “Gary” and named after Elbridge Gerry, a signer of the Declaration of Independence7). Travelling on that same route you’ll come to a crossroads, a hamlet also known by the name of Gerry. Now, your first thought might be that this quiet rural community might have once been used as a stage lot for a Hollywood western. As far as I know, you’d be wrong. According to the Gerry Rodeo website8, it all started when this fella by the name of Jack Cox wandered into these here parts way back when. A lotta folks kinda wondered about ol’ Jack when, in 1945, he suggested puttin’ on a rodeo as a way of raisin’ money for the Gerry Volunteer Fire Department. Ya see, back in them days they still had workin’ cowboys – mostly out west – and, well, ol’ Jack used to be one of ‘em. Now the good folks in Gerry got to thinkin’ and, shucks, didn’t they go and turn four acres of swamp into an arena and parking lot in all of seven days. And this was jest in time, too, ‘cuz right then Colonel Jim Eskew showed up with all his livestock and – wouldn’t ya know it – the first Gerry Rodeo was had. 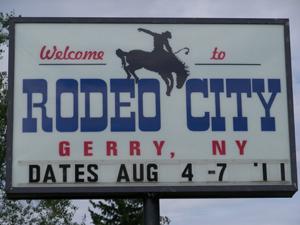 Today, the Gerry Rodeo counts itself as one of the longest running events in Chautauqua County. The seating capacity of the arena is 4,000 and there’s even a modern midway for those young’ens just itchin’ to leave the west behind and spin themselves dizzy. And if you thought Chiavetta’s at the Erie County Fair (which usually occurs the week after the Gerry Rodeo) was finger lickin’ good, then wait ‘til you try the famous Gerry Rodeo home-made barbecue sauce. Just don’t go there looking for beer. Now, you might be wondering why a rough and tumble cowboy event like the Gerry Rodeo doesn’t serve beer. There’s a story behind that. Paul Cooley told me the story. Paul is a long-time member and unofficial historian of the Gerry Volunteer Fire Department as well as a retired teacher of English and journalism at Cassadaga Valley Central School (which I just can’t help but saying in an Antonio Banderas accent every time we pass it on the way to visit my wife’s parents). In 1944, a year before the Rodeo started, the Department decided to have a tractor/horse pull for a fundraiser. The vote to offer a beer tent went narrowly in favor of those wanting to serve the adult beverage. The decision, however, sparked controversy, leading several members, including at least one official, to resign. The day of the event started well, with a veritable tent city surrounding the pulling field. The largest tent, of course, being the beer tent. But then a monumental rain and wind storm – Paul called it a mini-tornado – swept through the area, deluging the already moist grounds into a swampy quagmire and toppling several tents, including the notorious beer tent. My mother-in-law, who was there, remembers tractors and horses pulling the cars out of the axel deep mud. Since that ominous affair, the Department has never again approved serving beer. The heyday of cowboys might have vanished with the arrival of Alan Shepard and the Mercury Seven. Sure, when it comes to excitement, more folks picture a Ford Mustang rather than a bucking bronco. The idea of a rodeo may be as old as the Pony Express, Bill Cody’s first employer, but, face it, what little kid still doesn’t get excited about watching – and maybe even riding – horses? Of course, if we’re talking about something old that kids would enjoy, stay tuned for the next chapter. I passed by it for decades until my teenage daughter Catarina interned for a studio photographer. It was on that job that she, not I, discovered our next hidden gem. If you like this story, you’ll love Chris Carosa’s new book 50 Hidden Gems of Greater Western New York. Be sure to check out the book trailer on 50HiddenGems.com and sign up for the GreaterWesternNewYork.com newsletter so you can be the first on your street to find out when the book is published this fall.